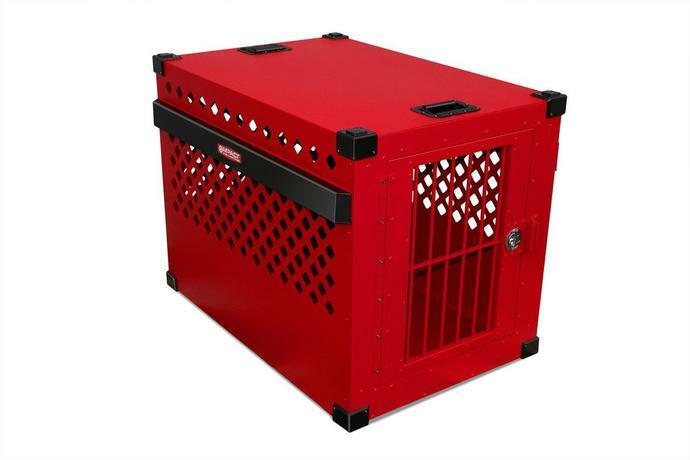 Certain breeds of dogs require a “CR 82” crate. This designation from IATA (the International Air Transport Association) comes from the Live Animal Regulations. (LAR) The IATA LAR recommends all the construction details for all kinds of crates – from seals to buffalo to dogs and cats to reptiles. The metal crate produced commercially from Impact (KonnectPet) and Zinger do not technically meet the requirements of a CR82 but most airlines will accept them in place of a custom made CR82. The airlines biggest concern is a dog that can chew out of a crate, and, in the past, that has caused huge damage inside aircraft to the internal cargo areas and even the wiring and controls for flying. Hence breeds like a American Staffordshire, American Pitbull, Dogo Argentino, American Bull terrier, Cane Corso are often listed as “dangerous dogs” requiring a chew proof crate. We happens to be a retailer for the Impact crates. Please click on this link to visit Impact and purchase a metal crate to suit your needs, or call us directly as we usually have 1-2 crates in stock. The crates come in a variety of styles, sizes and even great colors! And even if you don’t need it for shipping, the metal crates are a lot more durable than a plastic kennel – great for hunters on the go, high anxiety dogs (yep there is a special crate for this!) who suffer separation anxiety or other personality quirks when stressed. Previous postPets overheat in cars quickly!